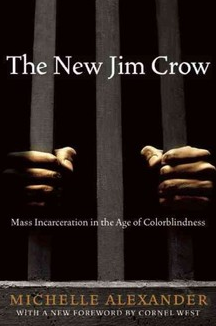 Jim Crow ~ still around. Lucky for us some really smart people continue to wrap their brains around racism—still so pervasive in America, and in some cases on the rise BECAUSE we have a black man in the White House. Remember ~ the bigots are procreating, too, so let’s keep the conversations/actions going. Turns out Steven Colbert is one of those really smart people…and so is Michelle Alexander. Not only do I have a hard copy of her book but also on my Kindle. GREAT BOOK. MUST READ. I tell everyone I know about it.